Relaxing one bedroom cabin on an 100 acre mountainside homestead. Relaxing one bedroom cabin on an 100 acre mountainside homestead, lovingly named 'Noon' and protected by the Blue Ridge Land Conservancy. Excellent for an Artist's/Writer’s retreat, a Friend's get together or a Couple's get away. Come unwind in the Blue Ridge Mountains. The Cabin at ’noon’ invites you to go on an adventure, spend time with nature. Breathe in scenic views, hike our private trails, rest in the hammock by the creek, contemplate, meditate, enjoy the best night sleep. Get creative, write, paint, try something new. Visit local shops, restaurants, art galleries, artisan studios, museums, wineries and breweries and the infamous Mill Mountain Star. Enjoy outdoor activities galore throughout the area or take a scenic drive along the beautiful Blue Ridge Parkway (access is 10 minute away). Stay for a night or an extended length of time (discounts apply). Be inspired or take delight in doing nothing at all. Our cozy one bedroom cabin, originally built as a visiting actors residence includes: 2 single beds with awesome mattresses for an amazing night's sleep*, comfortable living area with a couch and chair, tv/ dvd player/ Apple TV*/ wi-fi. Small, equipped kitchen with a table and two chairs, coffee maker (fresh coffee provided), microwave, refrigerator, no dishwasher. Fresh water, pure from our spring fed well. Private walking/hiking trails. Wood stove (wood provided). Original artwork. Hammock. Comfortable outdoor sitting areas. Covered patio with Big @$% grill and attached Patio with outdoor Fire Pit (wood and fire grate for cooking provided). While it is a self-sufficient, private space, we are only a phone call or text away to answer your questions or offer assistance. Our family lives and works on the property, during the day I am working or teaching in my studio which shares a yard with the cabin (I am a metalsmith/jeweler, if you wish to visit, come on over and/or we can arrange a ring making or other workshop (please request at least 2 weeks in advance- there is a workshop fee), or we might be in our organic garden below, or maintaining and enjoying the property. ~ As this space suits two(2) guests best, it can house up to four(4) comfortably. (for more than 2 people, 4 max- add a single or full size mattress for the LR floor upon request.) A fee will apply for each additional guest, for each night of the reservation. No parties or additional guests without host approval. Additional fee applies. When entering the property, leave the hustle and bustle behind, as you cross the “country moat” (see pic). We drive over the creek everyday and kids (and adults alike) love the feeling of ‘adventure’ when visiting. Please confirm your arrival time and we will greet you at the cabin and possibly introduce you to our dog. You will have your own parking space at the cabin for easy loading and unloading. The door will be unlocked. 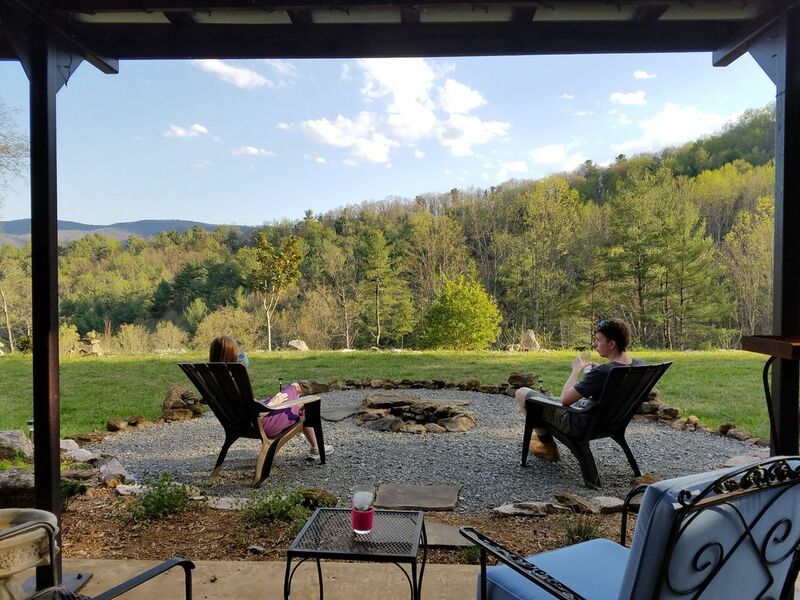 You will have access to the private walking/hiking trails throughout our mountain property, yard, outdoor sitting areas, hammock, covered patio and fire pit for your enjoyment. The scenic Blue Ridge Parkway is only a 10 minute drive away or drive 20 minutes to enjoy Roanoke’s downtown arts and cultural center. Center town Floyd is a 50 minute drive in the opposite direction. Access area colleges and universities in 30 to 55 minutes: Virginia Tech, Radford, Roanoke College and Hollins University. A 20 minute drive to Virginia Tech Carilion Research Center & School of Medicine in Roanoke. And, a 30 minute drive to the Roanoke/Blacksburg Regional Airport. We want you to feel welcome and enjoy your visit! We will greet you at the cabin upon arrival (see guest access), and if you wish, during your stay, you may request a guided Polaris ride around the mountain (opt-in). We are available to answer your questions and offer assistance at any time via phone, text, email or in person throughout the duration of your stay. * The cabin is equipped with Apple TV- which gives you access to Netflix and other network's shows. Welcome to The Cabin at 'n o o n'! I am a professional jeweler/designer/metalsmith and live/work with my writer husband extraordinaire, sports enthusiast son, sweet dog, silly cats and funny chickens on our beautiful 100 acre mountainside homestead, which is protected by the Blue Ridge Land Conservancy. We are very active, creative people dedicated to our family, friends, arts & cultural community, and sustainable living. We want you to feel welcome and enjoy your stay! We believe and have been told by family, friends and guests that there is something special here on our hundred acre wood. It is a feeling that one gets as soon as they cross the country moat. The Cabin at 'n o o n' is located on 100 private acres with hiking trails and creeks. You will have privacy and feel isolated from the rest of the world even though it is only a 20 minute drive to the center of downtown Roanoke. When you enter the property you will drive through a small creek or "country moat", your tires will get wet, and crossing the 'moat' adds to the sense of security and mystique. The view of Mason's Knob, the highest visible mountain, looks like a volcano from the Cabin and watching the stars in the sky is spectacular. Three piece bathroom with antique wash stand. A view of the beautiful Blue Ridge and Mason's Knob. Central heat as well as the wood stove. The awesome wood stove comes with matches, paper, kindling and wood ready for your enjoyment. Comfy resting area with a couch and chair, tv, Apple TV, dvd player, wi-fi, books and games. 1st morning coffee and sugar are provided. A toaster oven is provided. The kitchen includes a few essentials: coffee, tea, salt, pepper, oil, sugar, a few spices. There is a complete set of dishes, pots & pans and utensils. The Cabin at 'n o o n' has a well equipped kitchen with a table and 2 chairs by the wood stove. Table and two chairs, additional chairs (up to four) may be requested. A highchair is available upon request. For a great view, enjoy a meal, a cup of coffee or glass of local wine/beer on the patio. The cabin is equipped with Apple TV- which gives you access to Netflix and other network's shows. You will have access to a shared yard space with the owner's studio as well as an 100 acre wood with private trails, creeks, hammock, outdoor sitting areas, for your enjoyment, being one with nature. For a favorite view, enjoy the covered and uncovered sitting areas with a fire pit and big @$$ grill. All one level, drive up to door. There is a threshold at the front door and the interior doorways are approx 27" wide. We believe, and have been told by family, friends and guests alike that there is Something Special here at 'Noon'. It invokes a Sense of Place, Peace, Comfort, Inspiration and Curiosity.... Your body and mind are allowed the freedom to slow down, repose, get grounded and forget about your 'real world' responsibilities..... You can dip your toes in the creeks, go on a hike, relax in the hammock or by the fire, soak in the sun, be entranced by the stars and 'Just Be', the way Mother Nature intended. Sarah and Chris's Cabin at Noon is the unyielding evidence that paradise on Earth exists. The area is nestled so comfortably between ancient hills you can almost hear THEM comfortably snoring... which is a feat considering how well I slept in this incredibly homey cabin. The warmth of the furnace kept us nestled in an ambient glow that shimmered into waking with the sounds of softly singing birds across countless swaying trees. This place IS heaven, or at the very least, a bite size piece of it. If you can stay in the area, stay here. Thank you Chris and Sarah for sharing this beautiful place. As usual, Chris and Sarah have the perfect get away spot there is. Their hospitality is 2nd to none. This is the place to get away from the day to day mayhem and still be close to everything you need. Sarah, the host, was personable, friendly, and available for all questions or even just a chat. Nice walking trails to get a workout without leaving the property, easy drive to several beautiful hikes in the Appalachians including McAfee’s Knob. Good views, a fireplace, all the basics in the kitchen ... oh yes and reliable WiFi ...can’t ask for more. I really enjoyed my stay here. The owners were very friendly and accommodating. Thank you! Wonderful secluded cabin with amazing hosts in driving distance from Roanoke and nearby adventures! The Cabin at “Noon” exceeds all expectations by a wide margin! The pristine property yields a guaranteed relaxing stay in a natural environment. Sarah and Chris are delightful hosts who thoughtfully anticipate your every need. They make you feel welcome before even arriving at the property and offer great suggestions to make your trip unforgettable in addition to Sarah’s legendary home-made cookies. And in case of questions (or unlikely) emergencies, they are only a text or a short walk away. From the moment we traversed the moat/creek in our small SUV, we felt like we entered a peaceful retreat. We wished we would have walked the one-mile perimeter hike but that will have to wait until our next visit. We truly enjoyed our stay and would recommend this home to anyone looking for a great trip to Roanoke! Thank you Sarah and Chris! Mother Daughter adventure in the beautiful Blue Ridge Mountains. The Noon Cabin had everything we needed for a relaxing, comfortable few days away. Sarah was a great host and welcomed us with warm chocolate chip cookies and freshly ground coffee. We were able to tour Sarah’s art studio, enjoyed the wildlife (deer and turkeys), and a mild winter storm which left a fairy land of ice on the trees. The wood stove was loaded with wood and lit easily with one match! Comfortable beds, well stocked kitchen, great shower. Already planning our next visit! Visit local shops, restaurants, art galleries, artist studios, wineries and breweries, museums and the Roanoke Star. Enjoy outdoor activities galore throughout the area or take a scenic drive along the beautiful Blue Ridge Parkway.